I’m pretty sure that anybody who calls themselves an anime fan has seen or at least heard of Death Note at some point. Moreover, with the recent movie, drama and *ehem* Netflix adaptations, the series continues to gain popularity despite the fact that it has been 10 years since the anime adaptation was first broadcasted in Japan. This all-time favourite has won multiple awards and is commonly recommended by anime viewers as an introductory series to their non-anime-watching peers, and not without good reason. If you were given the power to kill anybody just by writing their name into a notebook, how would you use it? Personally, I’m not sure I’d know what to do with it, but when high school prodigy Yagami Light picks up a Death Note dropped from the Death God world into the human world by Shinigami Ryuk (out of boredom, mind you), Light evidently has a brilliant plan to utilize the notebook to its full potential and rid the world of evil. This eventually leads to a psychological cat-and-mouse chase between Light and L, an eccentric young man portrayed as the world’s greatest detective. Suspense. Originality. Thrill. These are the three words I’d attribute to Death Note’s success. The premise itself is one of the first of its kind and sets a precedent for later series in the same genre. The psychological aspect is definitely one of the main highlights of the series – the intricate mind games played between the two masterminds, L and Light, are full of unpredictable twists and turns that will keep you raving on the edge of your seat. 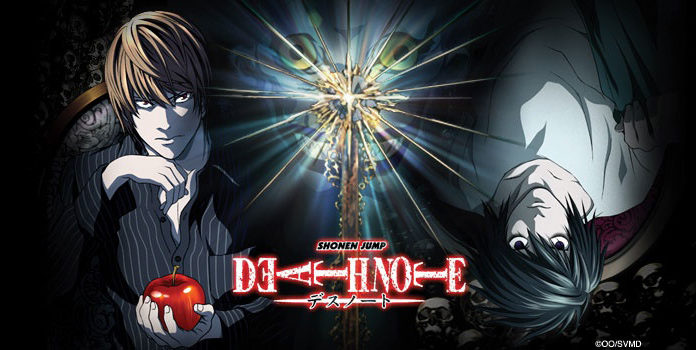 While Death Note does have a pretty solid story line, like many others who have watched the series, I feel that the first half of the series is undoubtedly much stronger the latter half. Without going into too much detail, after a certain unfortunate incident that happened around episode 20+, the story just seemed to start dragging and lose a lot of its initial focus. It’s not that the latter half of the series is terrible, it’s more that the first half is so superbly executed that the second half pales in comparison and leaves a bad taste to the end of the series. One thing about Death Note that stands out to me in particular is the fact that the series incorporates little to almost no fanservice. The series is loyal to its serious, semi-dark theme, any humour remains non-exaggerated and subtly incorporated; it’s probably one of the reasons why it is more appealing to the more mature audience. 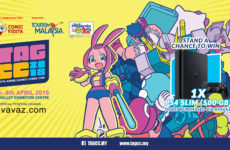 It relies heavily on the brilliance of its plot and exceptional character design to captivate its audience’s interest, proving that explicit fan service is not necessary to draw in viewers. Of course, the many interactions between Light and L may have led others to “ship” them (myself included), but then again, people will ship anything they can. What can I say… having come back to watch this series 4-5 times after experiencing the stunning visuals of more modern anime, I still feel that there is a certain quality about the art and animation that is admirable. Scenes flow into one another seamlessly. The first half of the series in particular is perfectly paced, such that each episode ends on a note of suspense that keep viewers wanting for more. While the graphics are nowhere as advanced (nor sparkly) as that of other contemporary anime such as KyoAni’s, Madhouse does a great job at conveying the darker mood and atmosphere of the series through a greyish, subdued palette. The art is amazing, hands-down. 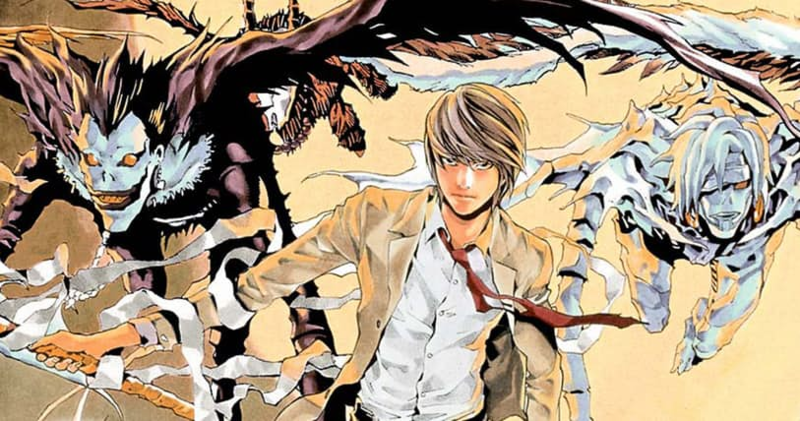 Manga artist Takeshi Obata’s distinctive art style is simply realistic and beautiful, accurately portraying the younger and good-looking characters (Light, L, Misa) to the elder and more sophisticated characters (Watari, Yagami Soichiro) to the other otherworldly characters (Ryuk, Rem). Kudos to Madhouse for successfully bringing Obata’s art into the anime adaptation! In my opinion, Death Note is an anime with one of the best OSTs of all time. 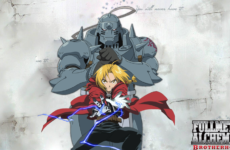 The original soundtrack composed by Taniuchi Hideki and Yoshihisa Hirano is unique and varied, each designed to capture specific moods in various scenes throughout the anime. 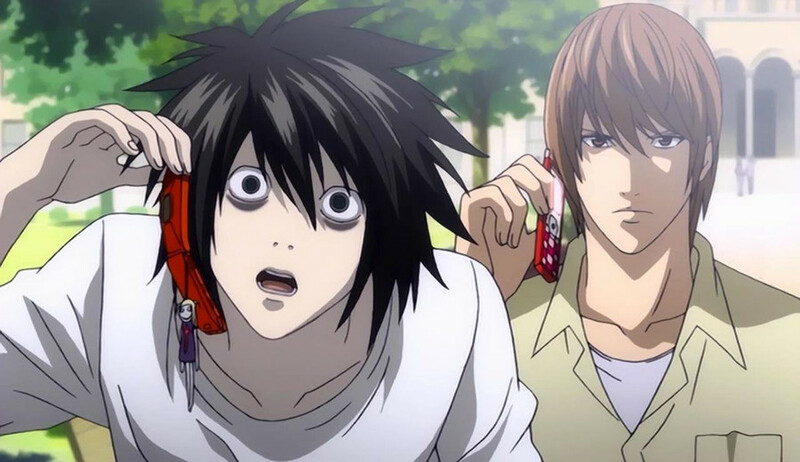 Some of my personal favorites are Death Note, L’s Theme B (used as my phone ringtone for a year), Light/Kira’s Theme, and Near’s Theme (recommended to my mom and cousin who ended up using it as their phone ringtones). As far as the OP/ED themes go, I really like the first opening and ending themes a lot, The World and Alumina by Nightmare. The darkish, gothic vibe given off by the visual kei band falls in place nicely. That being said, the latter opening and ending themes by Maximum the Hormone did not sit very well with me. I thought that there was a lot of noise rather than music, with a lot of unnecessary cussing, but maybe alternative rock is just not my thing. The voice acting in Death Note is amazing. Really. Miyano Mamoru does an exceptional job portraying Light as an intellectual with a mesmerizing air about him, and does even better as Light descends down his god-complex with his increasingly maniacal laughs. Yes, he is the one who did the iconic Kira laugh which is deemed one of the best anime laughs of all time. Which has been adapted into various different languages, by the way (but I prefer the original). Yamaguchi Kappei’s quiet calm voice and Hirano Aya’s cutesy voice fit very well into their respective characters as well! There are some pretty dope characterizations going on in Death Note. I mean, who would deny that L is one of the most iconic characters in the history of anime? Indeed, Light and L are both fully-fleshed, wonderfully complex individuals equally matched in brainpower, and the series leaves enough room to demonstrate each of their impressive intellectual ability such that it is often hard to root for only one of the two. As the series progresses, character development takes place as we see Light gradually becomes consumed by power and descends down the path to demise. Many of the characters are pretty likable, even those without a lot of screen time – Matt who only had a one-time appearance has a whole fanbase swooning over him outside the series. The main downfall would be that L and Light’s characters are so outstanding that many of the other characters suddenly introduced in the latter half of the series seem much weaker and uninteresting in general. I couldn’t find myself empathizing very much with them and their causes. The power to kill with something as ordinary as a notebook is in itself unique, especially back when Death Note first aired. Plot master Tsugumi Ohba takes it up a notch by formulating a painstaking list of rules that govern use of the Note. In the anime adaptation, two unique rules are displayed in each episode – with 37 episodes in total, you do the math. Supernatural elements are backed with logic and reasoning, enabling them to be incorporated into the series in a relatively realistic, believable manner. Other supernatural elements in the series would be the existence of Death Gods (Shinigami). All in all, Death Note is a quality anime classic that deserves all the praise it gets. There is a certain allure to it – it has enough depth to it to attract those with a more sophisticated taste, yet is not too complicated for the younger audiences to enjoy. Art, characters, music, pacing, this anime has it all; the only downfall for me is that the second half falls short to the superior first half, but that again is debatable. 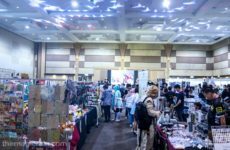 Collectibles & Figurines Galore At The First Ever Toys, Anime, Games & Comic Con!